The vast forested areas grew colossal numbers of trees such as hazel, oak, ash, beech, and many others. The condition of the soil in any one area would dictate the species of tree that inhabited those zones, in much the same way that they do today. Modern man's intervention and modification of the landscape has to a great extent affected what grew where and when. The elevation and rainfall or moistness of the soil are the greatest factors which control how well any one species will fair. 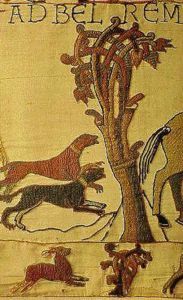 A very detailed picture of how individual species of tree have survived the Saxons and Vikings comes form the work of Archeobotanists who study the levels of pollen that have settled in the soil. The soil is sampled via a corer that 'drills' out a soil sample that is an inch or two in diameter and a few feet long. From this samples can be extracted and examined microscopically to analyse what types of pollen have become trapped in the soil over time. Other types of analysis are self evident, as it takes only a little time to work out what timbers were used to make an object, thereby indicating what trees were in the local area. Even the impressions of grain from timber is enough to deduce what was originally. One example is the use of Hazel, which was one of the most used species for brooms and wattle as in 'wattle and daub' for house walls. Here, the vital ingredient that preserved the evidence was fire. At some point in the Anglo-Saxon period, a house caught fire and as you can imagine burnt the house quite literally to the ground. However, the fierce flames and the high temperatures fired the clay that surrounded the hazel wattling in the walls, preserving the information for at least a thousand years. 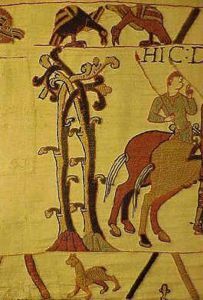 From detail such as this, we can now say with confidence that the Saxons used whole hazel rods rather than split ones in the wattle, which differs from medieval practice. This evidence shows us that oak for buildings, furniture and ships; ash, field maple and alder used by the turner to make bowls, cups and spoons; ash for spear shafts; linden for shields; box for boxes and caskets; elm, ash and yew for bows and many more timbers besides were common materials, simply because they were on the doorstep. The reduction of such resource through use can be seen in the pollen record, especially as no-one was practising large scale re-planting programmes. Whilst the population wasn't huge, the creeping clearance can be identified. Even if the ground that the trees were felled from wasn't immediately ploughed, any small shoots of new trees were going to be eaten by livestock, thereby stifling any new regeneration of woods. In addition of timber, the oak and beech forests also provided mast pastures for the grazing of swine and were gleaned for nuts and berries at certain times of the year, as added sustinence for stretched resources over the winter period. Unlikely materials such as moss, gathered and used as insulation between walls and as 'toilet paper' came from the woods. In the early autumn months, fungi was collected, just as it was from the fields. This added yet more variety and nutritional diversity to the diet. A great deal of foodstuffs were dried and stored for the coming winter, to help ensure that as the months of February and March went by without yeilding any new shoots, bulbs etc, there was always something put by. Some time after the woodland was cleared it was eventually possible to grow crops. Careful examination of pollen, cabonised grain from middens or fire places have shown that the Saxons were cultivating the same crops as their neighbours in Europe. These are wheat, oats, barley and rye. It is also thought that crops of peas and beans were cultivated, however, it is not clear if root crops like onion and carrot (a pale parsnip variety of carrot) were cultivated, or if they grew wild and were collected. The general view is that they may have been collected to begin with, although this would assume that the British peoples were gathering them at the time of the arrival of the Saxons, which is unlikely. Herbs such as wild garlic, sorrel and lamb's tounge grew wild but others like mint, mustard were also grown near the house for daily use. Wild fruit and berries were important too, as welcome additions in the autumn months. Almost every plant was used for some purpose. Crab apples were used as were sloes, rose hips and rowan berries. Bilberries, blackberries and strawberries were also eaten when available. Fungi not just eaten but used also for medicine, and probably for dyeing. The open moors and heaths were another source for other varieties of plants, especially berries, as well as providing areas for sheep and goat grazing. Heather from the moors was used for bedding, roofing, making brooms and for dyeing wool, just as much as for the sweet fragrence it gave off when crushed. From the marshes, fens and river-banks, rushes and reeds were harvested for use in thatching, with tons needed just for one dwelling. The rushes were employed in making woven baskets and mats. Reed tips provided good tinder and the hollow stems were cut to make musical whistles. Boggy areas also provided many medicinal herbs as did the roots of plants such as iris and flag that grew in the ponds and lakes. Many plants were used in medicine, in salves or balms, sometimes as infusions and poultices, or taken by mouth. These included; eyebright for eye infections, comfrey for healing broken bones, camomile for digestive illnesses, and the humble onion for making into a soup to be eaten by the hapless warrior for deep wounds to the stomach. This was really a simple test in as much that if you could smell the onions in the wound, then the wall of the stomach was cut, indicating that death was soon to follow. not a great deal of use really, but perhaps one that meant that remedies weren't wasted on the mortally wounded. Lots of leaves, roots, berries, bark and lichens were used for dying. 70% of all plants provide a yellow dye when boiled, although most were next to useless to actually dye with. The most well known and reliable of these is Weld, that grows best in disturbed ground. It is quite common to see it on the roadside today. Other specific plants will yield other colours. Woad being the most famous and was often cultivated for it's blue dye. Madder-root for the various reds (the leaves were also a useful abrasive), walnut hulls give a brown dye and alkanet shades of lilac, and these are only a few of the best examples. What is fairly safe to say is that building upon the knowledge of the multitudes of people who have inhabited this island, the Saxons and the Vikings were extremely aware of what properties the various plants and vegetation could be put to. This does not mean though that they knew why something was necessarily good for the user, or bad, however, just because they did not understand the mechanics of their actions meant that they were in some shape or form stupid. I am readily typing this to add to the world wide web, but I am clueless as to how this computer does what it does. So call me stupid. Last updated 31 March, 2003. Article by Roland Williamson 1999; Illustrations by Colin Levick.